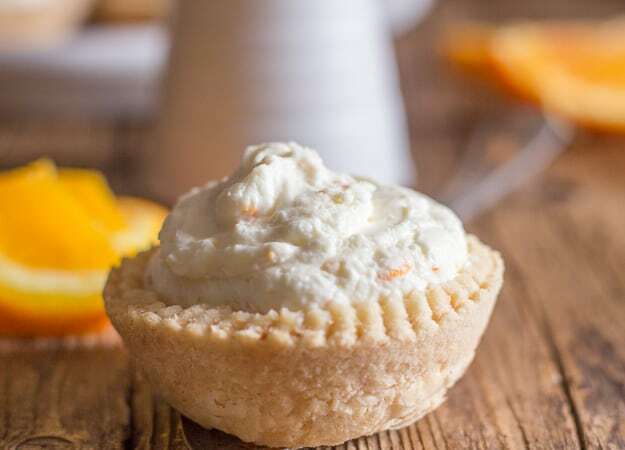 Orange Cheesecake Tarts a flaky pie crust filled with a creamy no bake orange filling. 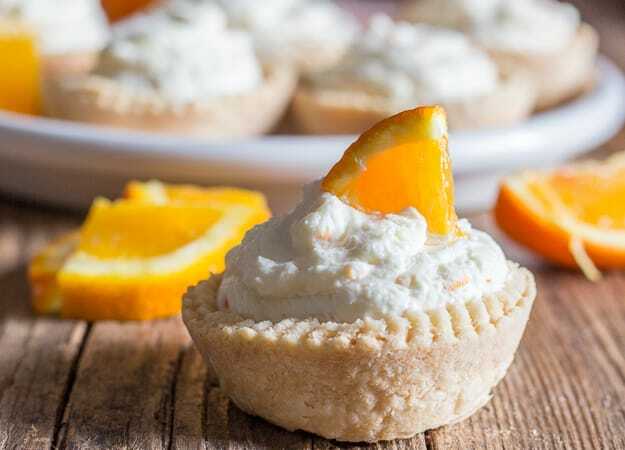 These mini tarts will be gone in minutes. The perfect dessert or snack. So delicious! I have to say I am usually an Apple Person, I love anything Apple and I adore them Raw. For me they are the perfect snack. But this year I have been going crazy for oranges, my mouth waters just looking at an orange. So when I made my Mom’s Pastry Crust I knew what I was going to make with half of the dough. 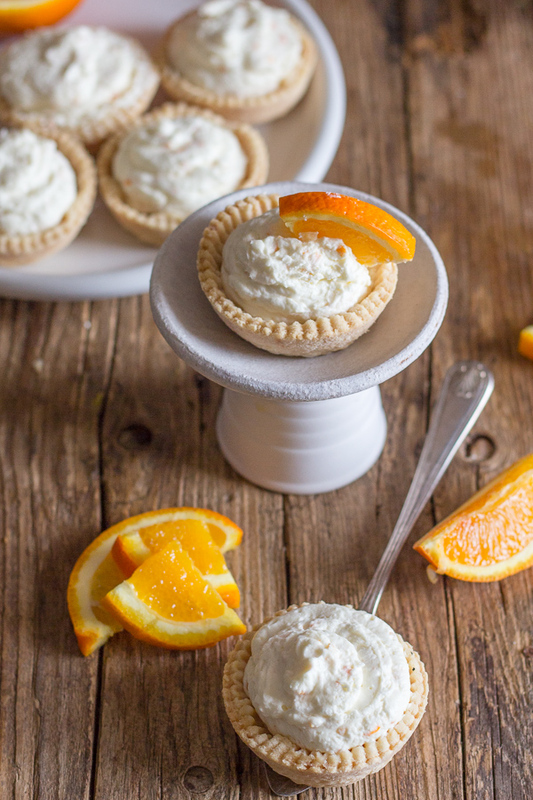 Yup, Creamy Orange Cheesecake Tarts. The first thing I did was I blind baked the tarts. 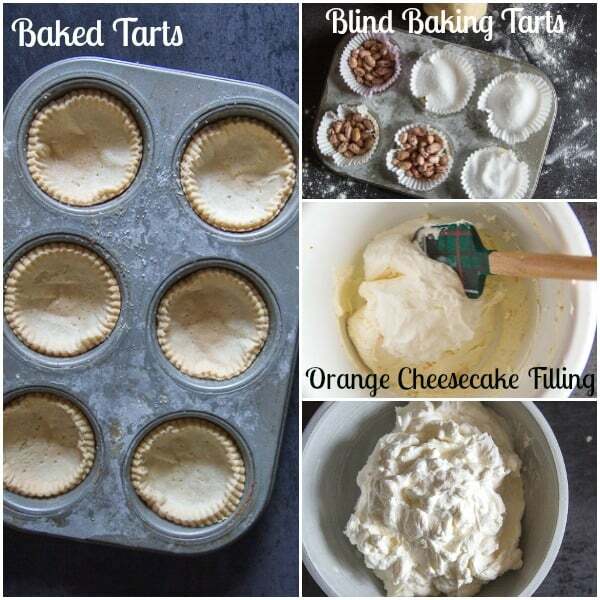 How to Blind Bake Tarts. Roll half the dough on a lightly floured flat surface to approximately 1/8- to 1/4-inch thickness. With a round cookie cutter cut out 6-8 circles. Trim the excess dough with a sharp knife. Prick the bottoms of each shell with a fork. Place a square of parchment paper or a cupcake casing in each shell. Fill with some dried beans, rice or sugar. Bake for approximately 10 minutes, then remove the paper and dried beans and bake again for approximately 5 minutes or until golden brown. 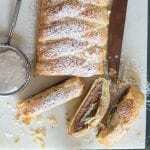 While the tarts were baking, I made the creamy filling. I added my favourite Mascarpone into the mixture because I think it gives it an extra dose of creaminess, and I just love the delicate flavour it gives to fillings. Beat the whipped cream until stiff. Beat together the mascarpone, cream cheese, zest, sugar and milk until completely combined. Then fold in the whipped cream until smooth and creamy. Fill the cooled tarts and refrigerate for approximately 4 hours. 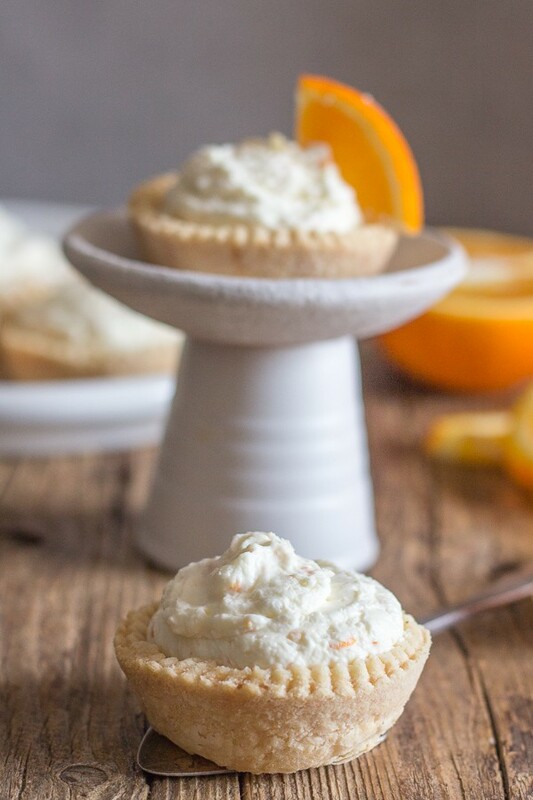 These Orange Cheesecake Tarts are the perfect Dessert. Everyone will love them. I added lots of orange zest because I wanted a very Orange Cheesecake Filling. 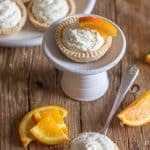 More Orange Dessert Recipes You may enjoy! 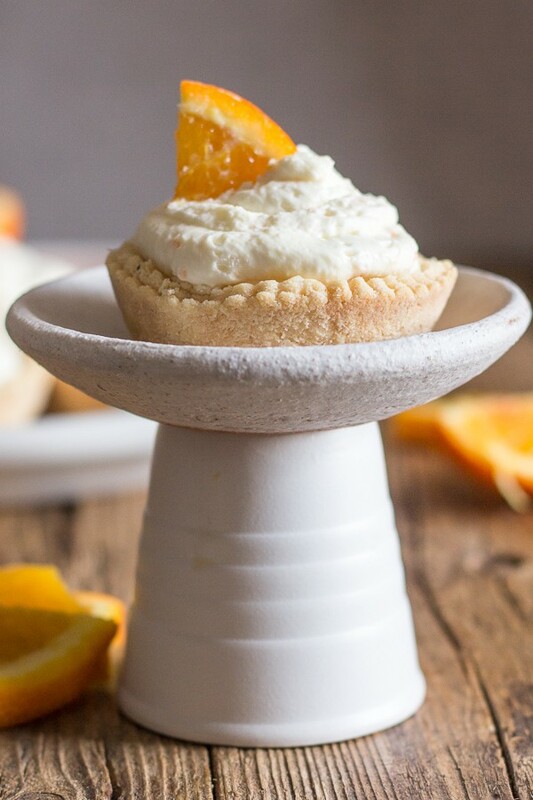 So if you love oranges or anything orange flavoured you are going to love these easy Orange Cheesecake Tarts. And if you don’t want to make tarts, a pie would work just as well! Enjoy! Prepare Easy Homemade Pie Dough. Chill dough for 30 minutes. 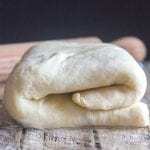 Remove dough from the fridge and roll out half onto a floured flat surface to approximately 1/8- to 1/4-inch thickness. 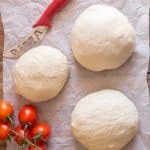 (other half of the dough can be frozen if you are not using it). With a round cookie cutter (medium to large depending on the size of the muffin tin you use) cut out 6-8 circles. Place a circle in a each muffin cup (flatten into place with the bottom of a small glass lightly floured). Trim any excess dough with a sharp knife. Prick the bottoms of each shell with a fork. Place a square of parchment paper or a cupcake casing in each shell, and fill each one with some dried beans, rice or sugar. Bake for approximately 10 minutes, then remove the paper and dried beans (be careful it is hot) and then bake again for approximately 5 minutes or until golden. Remove the tarts from the oven and let cool completely before filling. While the shells are cooling make the filling. In a medium bowl beat the cream until very stiff. 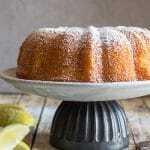 In a large bowl beat together until smooth and creamy the cream cheese, mascarpone, zest, sugar and the milk. Gently fold the whipped cream into the mascarpone mixture and combine until smooth. Fill the cooled tart shells and refrigerate for approximately 4 hours or over night. Top with a fresh orange slice before serving. Enjoy! Just added this beauty to my Easter list. Grazie mille ! Thanks so much hope you enjoy it!